A July 2, 1870 Harpers Weekly illustration of the game. The Red Stockings ended the 1869 season undefeated in 57 games. They began 1870 with an extended Southern tour into New Orleans. After defeating several area nines back home in Cincinnati, the winning streak reached 71 games. But the stiffest competition was still in the East and it was there the Red Stockings would run the gauntlet. As in 1869, the Cincinnati club organized a long road trip, beginning in Cleveland on May 31, and ending with a match in Washington, D.C. on June 28. After defeating the Cleveland boys, they moved through upstate New York and into Massachusetts. The traveling correspondent from the Cincinnati Commercial noted that the famous Red Stockings attracted “great attention in the streets,” and created “much excitement along the route and in the cities.” The Red Stockings arrived in New York on June 12, their winning streak at 80 games. Not everyone treated them so warmly there. The New York Herald criticized the club for dictating such harsh financial terms that New York clubs were forced to raise ticket prices to a minimum of 50 cents. But the Red Stockings directors believed the New Yorkers would pay. They were right. More than 7,000 turned out the next day to watch Cincinnati easily defeat the elite New York club, the Mutuals, 16–3. After the victory, the papers predicted another unbeaten Eastern tour for the invaders from the West. The next day, the Red Stockings played the Atlantics of Brooklyn, a team they had defeated soundly in 1869, 32–10. By game time between 12,000 and 15,000 spectators were on the grounds, many thousands standing in a semi-circle that stretched deep into the outfield. The Atlantics appeared in their traditional uniform of long dark blue pants and white shirts with an “A” on the front, and the Red Stockings, in their white uniforms and long red hose, tipped their caps as they came onto the field to acknowledge the polite applause of the spectators. 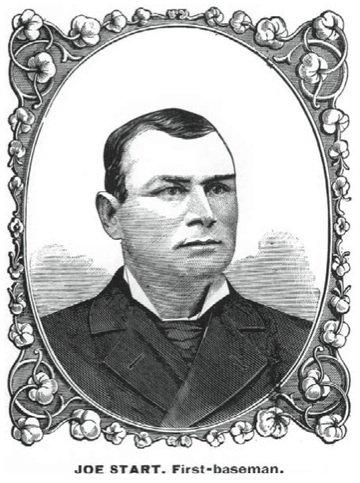 Seven members of the Atlantics were holdovers from the 1869 team; the main addition was George Zettlein, a powerful pitcher the Red Stockings had never faced. The Red Stockings edged out to a 3–0 lead, but sloppy fielding by third baseman Fred Waterman, first baseman Charles Gould and second baseman Charlie Sweasy let the Atlantics take the lead, 4–3, after six innings. In the top of the seventh, George Wright quieted the big crowd with a single that drove in two runs, and the Red Stockings reclaimed the lead, 5–4. The Atlantics tied the score in the eighth, 5–5, and that is where it stood after nine full innings. The rules of the era did not dictate extra innings unless one captain wished the game to continue. Harry Wright could well have taken the tie, and kept the unbeaten string alive, and that is what the umpire and the Atlantics captain Bob Ferguson assumed would happen. The umpire left the field, and Ferguson’s Atlantics headed to their clubhouse. But Harry engaged Ferguson in discussion about continuing. Ferguson seemed content to accept the tie, but Harry persisted. Finally, the umpire was recalled, the players returned, and the game resumed. 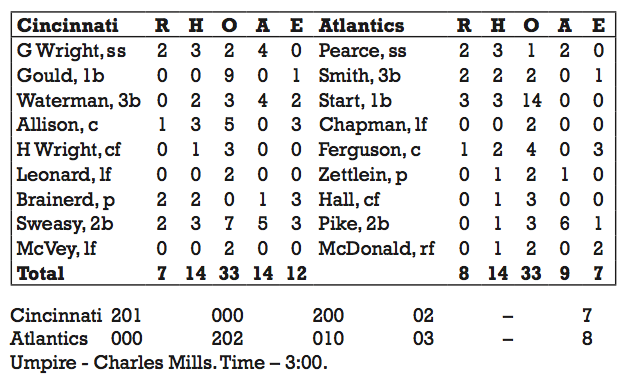 The Red Stockings were out in order in the top of the 10th; the Atlantics mounted a rally in the bottom of the inning. With two on and one out, George Wright moved to catch a short fly ball. But instead he let it bounce, and with no infield fly rule yet written, he easily started a double play. In the 11th, the Red Stockings appeared to have won the game with a two-run rally. But the Red Stockings’ ace pitcher, Asa Brainard, now seemed to tire. With one on and no outs, Joe Start, the Atlantic first baseman, lined a ball far over Cal McVey’s head in right field. The ball rolled into the crowd, where, by most accounts, an exuberant spectator jumped on McVey’s back. McVey shook him off and returned the ball to the infield. One run scored and the batter reached third. The Red Stockings finally got an out, but then Ferguson singled home the tying run, and Zettlein followed with another hit, putting runners on first and second. And then came the play that ended the streak. George Hall, the Atlantics’ center fielder, bounced a ball to George Wright, a sure double play, but George’s throw sailed by Sweasy, and Ferguson, running hard from second, scored the winning run.